I think you mean you don't know why you are winning ... Have you ever tried to teach someone else to trade? Teaching is often a good way of learning, I think. Ultimately I'm not sure it's important to know why are winning - as long as you keep your discipline, and can recognise when you are losing. Blimey, almost a year since I posted on this thread. Not had a great year (outside of betting) so really not focussed on this so much, results have been very up and down, mainly down, still turned a profit for 2015 somehow, as I have done every year since I started in 2012 (I think it was, stats are at work). 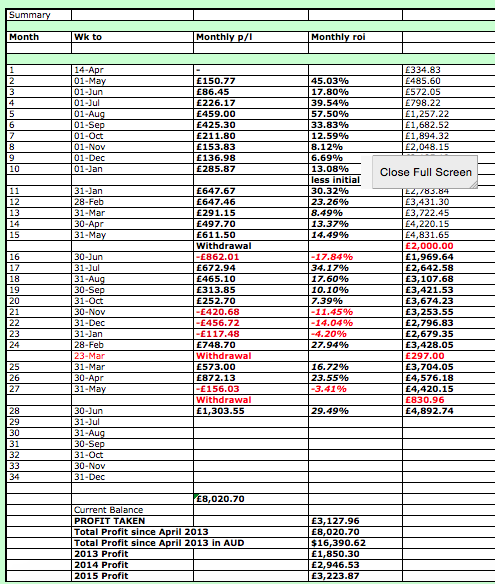 I'll post up my very ugly p&l later, lots of red. I honestly think that posting on this thread massively helps keep my discipline. Also hoping to trade under/over 2.5 goals in the Euros, or at least the early kick offs as am worried about oversleeping for the 5am starts, not ruling those out though. Well today is proving quite fruitful, having backed at 2.48 the price came in to 2.3ish pretty soon after, was hoping to hold out for the draw to go odds on, in the end the draw came in to 2.14 then drifted out again (I had £400 more matched at 2.36), then when it came back in again I managed to lay the draw at 2.12 and back England at 2.18 and 2.26. No real regrets as both times there wasn't really much liquidity so when matched they may have been bigger than I kind of deserved. About 10mins later the draw was indeed matched at a shade of odds on which was a shame. The main reason I bailed out was that rain wasn't forecast till 11am (start time), had that come slightly later the draw could have drifted right out, as I don't trust SL not to collapse I would have certainly traded out before then. It really is a shame there isn't test cricket every week, I seem to win on pretty much every match. What about 50 over, 20 over or domestic 3 or 5 day games? Nope, nothing comes close to test cricket, partly to do with the fact I have time to recover losses but for some reason the market just seems to want to the way I think it will (more often than not, or often enough to be profitable). Didn't think too much of it, not the worst trade (especially by recent standards) until on Sunday morning (Saturday was far too big a drinking day to contemplate trading) when I thought I'd see what I could to recoup my losses. OK, time to revisit this thread for a bit of Premier League trading fun, the days where easy money are made like I did during this thread are long gone.